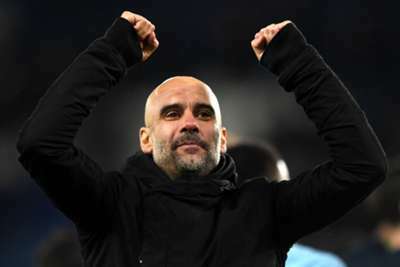 Pep Guardiola hailed an "incredible" professional debut from Eric Garcia after the 17-year-old starred in Manchester City's EFL Cup quarter-final triumph at Leicester City. As they did at the same stage in last season's competition, the holders needed penalties to progress after a 1-1 draw at the King Power Stadium. Kevin De Bruyne scored a spectacular opener but Marc Albrighton hauled the hosts level, only to see penalty misses from team-mates Christian Fuchs, James Maddison and Caglar Soyuncu help Guardiola's men through. During the 90 minutes, former Barcelona youth graduate Garcia caught the eye at the heart of defence alongside Nicolas Otamendi and Guardiola suggested the teenager would have featured sooner if not for an injury setback earlier this season. "He was incredible. He has a lot – a lot – of personality," he told a post-match news conference. "In the pre-season, in the United States, he was incredible. He commanded all the [defensive] line. He played against Liverpool and Bayern Munich, he was incredible. "He had a tough injury and for two months he could not play with us. "He is a guy who has a lot of sense of the position. He is so smart; he is not the strongest in the air with the headers, he is not the fastest one but few times do the opposition win one position where he is. "He is able to guide the line and has a lot of personality to play – good vision, good passing." Guardiola added: "I am very pleased for him. He did not make one mistake and with the ball he played with huge personality. "It's one thing to be in a friendly game in pre-season and another to be in a knockout game. I am so delighted."